who observes the skyrocketing number of incendiary political opinion shows on television and radio might conclude that political vitriol on the airwaves is fueled by the increasingly partisan American political system. 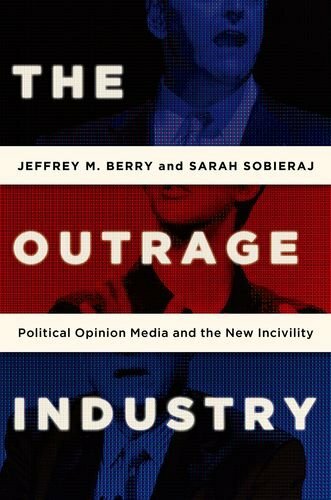 But in The Outrage Industry Jeffrey M. Berry and Sarah Sobieraj show how the proliferation of outrage-the provocative, hyperbolic style of commentary delivered by hosts like Ed Schultz, Bill O'Reilly, and Sean Hannity- says more about regulatory, technological, and cultural changes, than it does about our political inclinations.Berry and Sobieraj tackle the mechanics of outrage rhetoric, exploring its various forms such as mockery, emotional display, fear mongering, audience flattery, and conspiracy theories. They then investigate the impact of outrage rhetoric-which stigmatizes cooperation and brands collaboration and compromise as weak-on a contemporary political landscape that features frequent straight-party voting in Congress. Outrage tactics have also facilitated the growth of the Tea Party, a movement which appeals to older, white conservatives and has dragged the GOP farther away from the demographically significant moderates whose favor it should be courting. Finally, The Outrage Industry examines how these shows sour our own political lives, exacerbating anxieties about political talk and collaboration in our own communities. Drawing from a rich base of evidence, this book forces all of us to consider the negative consequences that flow from our increasingly hyper-partisan political media. Sarah Sobieraj is Assistant Professor of Sociology at Tufts University.